I had such a terrible week last week starting with a burst water pipe under the kitchen sink that flooded the dining room carpet and resulted in $1000 of damage to carpet etc. The week got worse on a daily basis until I collapsed with exhaustion and stress on Friday. But I did have one big bright note and that was the matchbox swap! I fluffed and fiddled and cut and glued and arranged and re-arranged until I was satisfied. So much fun!!! Karen from Canada, please do not peek as I am going to put up a photo of your matchbox and goodies on this post. 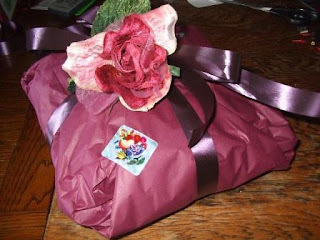 Also managed to get my Mum's birthday parcel off to her. I can't wait to hear her reaction as everything is so deliciously pretty and pink inside her parcels. I have also done quite a bit of thrifting as a consolation prize for having such a bad week! The shop is very quiet at the moment because it is winter in NZ and quite cold and wet most days. It gives me a chance to create, I am so inspired at the moment from the hours I have spent looking at other lovely bloggers creations. I have baby shoes, a lampshade and cards on the go at the moment, nothing finished though! And now some piccys . 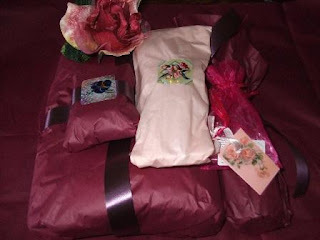 . .
First my Mums wrapped gifts, inside is a Victorian white replica nightgown, long ruffled sleeves, pin tucks and lots of frills, lavender linen water, a pink tassle, little love heart chocolates, rose scented soap in a shabby chic fabric bag and the velvet rose which I have attached to the outside of the parcel. And now Karen from Canada NO PEEKING! 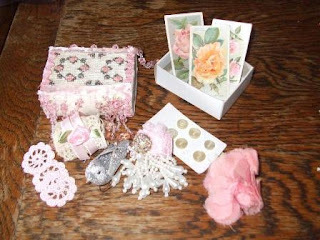 Here is her matchbox, from her blog I established she is quite a crafty gal who has started collecting birds and loves pink. I covered the outside of the matchbox with a piece of my favourite Robin Pandolph quilters fabric and then cut and attached a cross stitch of a quilt and edged it with pink beaded ribbon. 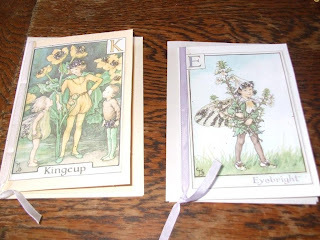 I also made Mum and Karen flower fairy cards represented their initials. You can't tell from the photo but there are silver glittery highlights on the cards! And finally my soul soothing treasure hunting, just a few goodies I got . 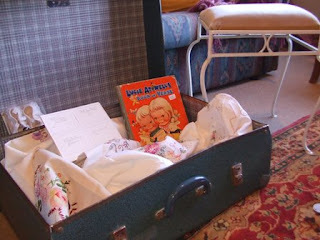 . .
Vintage Suitcase I am going to paint . . . pink! Loads of hand embroidered vintage linen including sets of napkins and big table cloths, vintage childrens book to do something with, wrought iron boudoir stool (wrought iron is big in NZ) and the most divine vintage baby shoes. . .